– Free stuff. 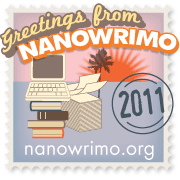 The NaNoWriMo official website provides links to a number of great giveaways every year for those that sign up for the challenge and also some great gifts for the winners. Several sites are also joining the giveaway bandwagon and providing access to writing tools for free during the Novel Writing Month of November.